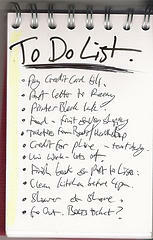 I used to think that keeping a to-do list was a common thing but actually it is very uncommon. What’s even less common is to have a to-do list that isn’t just a numbered list of things to be done one day. Stress is produced in our lives when we don’t know what to do. The pressure of having a big project is different to stressing about the project. Pressure is a challenge that draws us up to higher levels. Stress is when our minds are overloaded because of that pressure – but I believe you can have pressure without stress! Stress comes when you don’t know what to do with your project. The most common mistake with a to-do list is to just make a hope list or a project list. While you should keep a project list of things that you are working on, and a someday list for things to be done one day in the future but not necessarily to be done, the main to-do list is where your very next actions go. This is also called your “Next List”. For example, “Clean the car” is not a task, it is a project, and therefore writing that down in your to-do list isn’t helpful, it’s daunting. Rather you should write down “Pick up vacuum cleaner to clean car”, and “Purchase car cleaning products.” This way you have the next action and relieve stress. Next List. This is where all your next tangible, actionable and measurable actions go. Project List. Here you keep a running list of the projects that you are actively working on, as opposed to projects that have been archived. If you have too many projects here then your alarm bells go off. Someday List. All the things that you want to do one day that don’t require a deadline. Waiting For List. Finally, you have a list for all the things that you are waiting to hear back and/or have delegated to others. Having these four to-do lists means you really need a to-do manager that you can access online, on your phone, on your iPad, on your computer and so. I use Action Method which organises my tasks either according to the project that they are in, or in a flat Next List view. Action Method also allows me to delegate tasks from within the programme. What practical help do you need right now with running a to-do list? Let us know so that the Friends here can help. Shades of SMART communications, Scott. I see your point, here. It’s important to really know what you want/need to accomplish and to be able to see all the steps involved before you put it on your T-DL. I’m not about to list out all the actions necessary to get two new tires mounted on my truck whilst taking my car in for an alignment, but I definitely had to go through those steps in my mind’s eye before I wrote “tires/alignment” on my T-DL. There’s also merit in keeping track of what actually got done instead of jotting down what we’d like to get done. “This is what I actually did today” is reinforcement. I’m rubbish at this, never done it, probably why I’m so disorganised. But this week I am taking myself in-hand, I’m getting a journal book that I can use for To-Do listing. You never know, I might get enough done to create enough time to read that book “Getting things Done” that you sent to me!